Sea, Sand and Sun lovers' paradise... 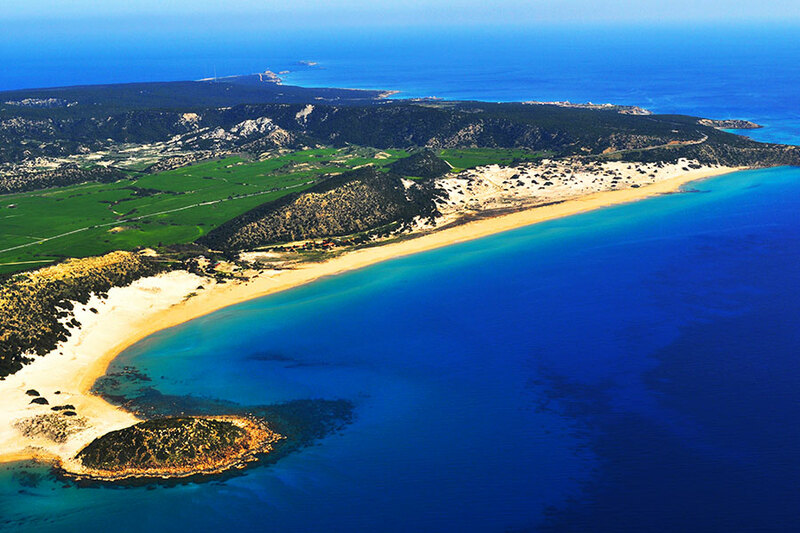 Your guide to best beaches in Northern Cyprus. 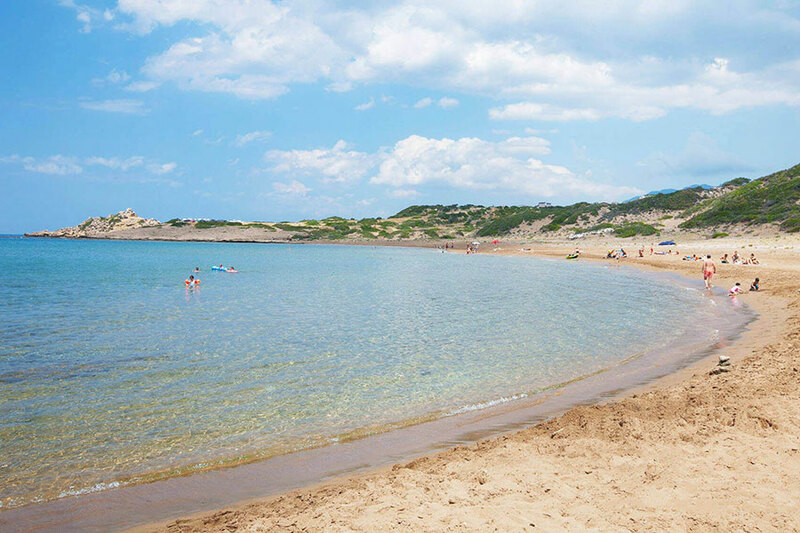 Where are the best beaches in North Cyprus? 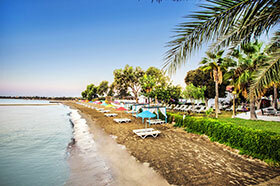 North Cyprus is a beach lover's paradise. 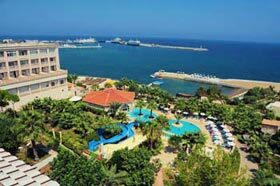 The beaches in Northern Cyprus are one of the best attractions of the island. 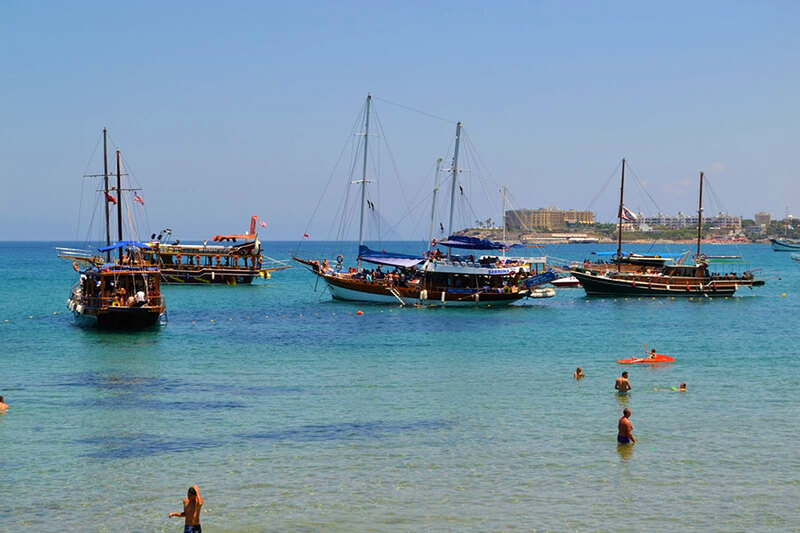 North Cyprus coastlines are stretched with long sandy beaches offering many activities such as water sports, snorkeling, scuba diving, and ideal for diving holidays. 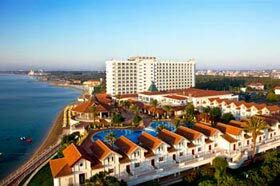 Most of the hotel and public beaches offer facilities such as sun-beds, umbrellas, toilets, parasols and restaurants. 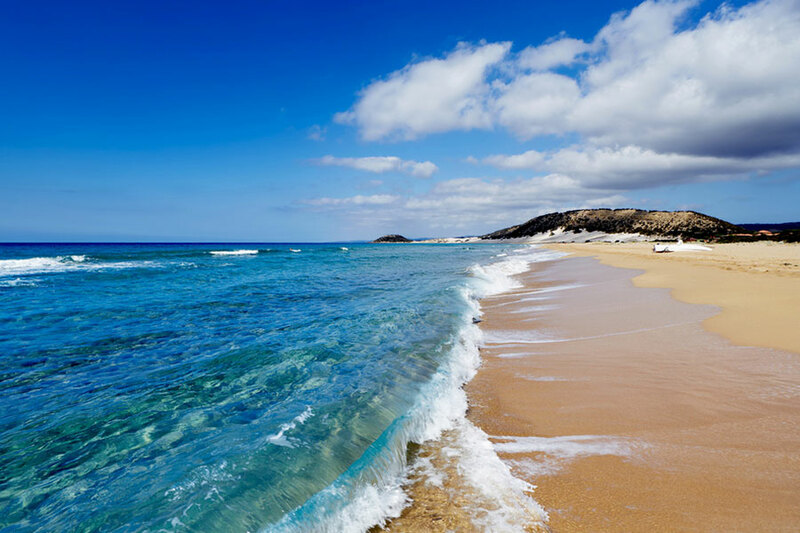 If you would like to have your own privacy then you need a rental car to go to one of the deserted beaches of North Cyprus. As you reach to the northern-most tip of the island you will be greeted by the world famous Karpas Golden Beach with miles of golden sands. Golden Beach is known as the island's most beautiful beach, and is referred to as the birth place of Aphrodite (Venus), the goddess of love and beauty in mythology. According to legend, the calm sea suddenly gets excited by a sparkling white wave, and with this wave, Aphrodite steps to the shore on a shell. Karpas Golden Beach is getting busier in these days but it is so big! There is a room for everyone. Ideal for those who would like to get away from the crowd, and seeking their own privacy. You need a car hire to go to Karpas Peninsula. Don't forget to take an umbrella and refreshments if you are planning to spend your day on the Karpas Golden Beach. 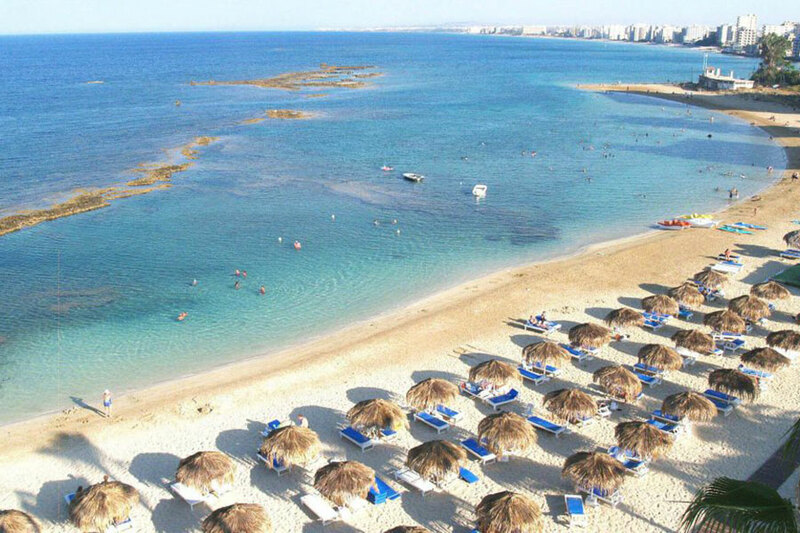 Situated 5.5 km north of Famagusta on the eastern coast of the Cyprus Island, the Glapsides Beach is the third best beach in North Cyprus. Because of its convenient location on the bay, local people and students flock to this long sandy beach. The beach is run by local municipality, and the entrance is free of charge. 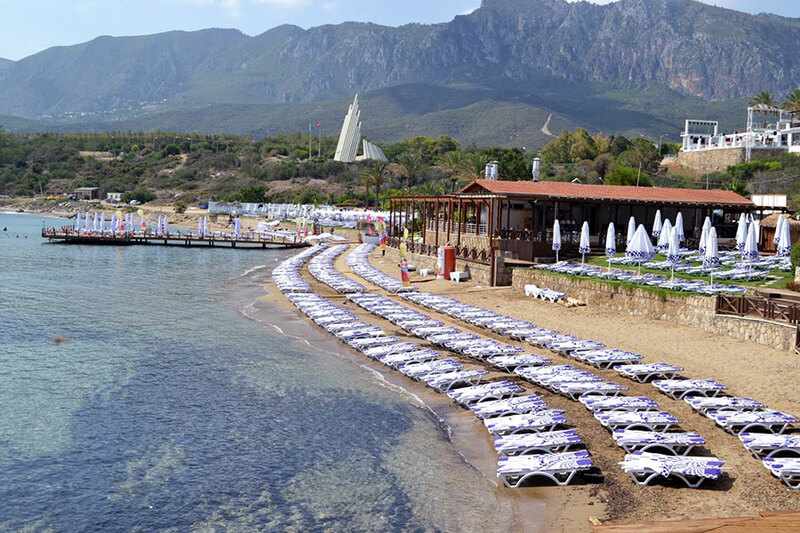 Sun beds and umbrellas can be obtained with a small fee. 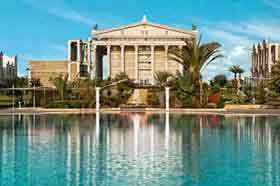 The Glapsides's blue water captivates water sports enthusiasts and scuba divers. Explore the mystery of the underwater world with scuba diving or join beach volleyball tournaments arranged on the beach. The beach also offers camping opportunities. You will be lost in the magical blue waters of the Mediterranean. 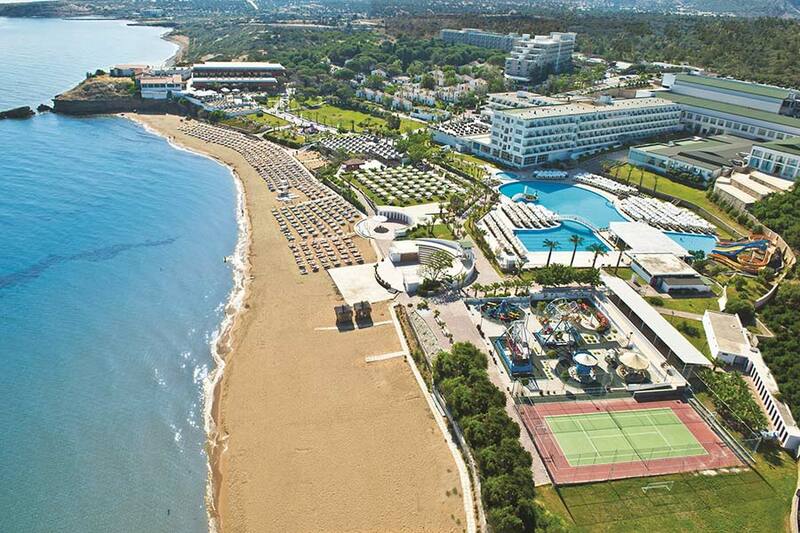 The Escape Beach Club (locally know as 'Yavuz Çıkarma Plajı') is a very inviting beach situated on the highway as you come from Kyrenia to Alsancak. An entry fee is paid to enjoy every comfort that ESCAPE offers. Once inside, you can sunbathe either on the cushions on the lawn or on the sun loungers on the sands. When you are hungry you can enjoy great selection of food offered in the restaurant. The Escape offers extensive options for those who seek more than sea, sand and sun. 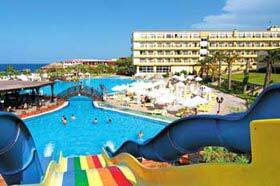 Some of the water sports on the offer are scuba diving, jet skiing and parasailing. The small island just across the bay, serves as a natural wave-breaking. Thus, the beach remains smooth all the time. Especially a favourite gathering place for Cypriot youths, it gets very crowded during the weekends. With its alternative leisure facilities to enjoy sea, sun and sand, the Escape is one of the most popular beaches in Kyrenia, Northern Cyprus. One of the best public beach is Alagadi where you can see turtles nesting during the summer season. There are no facilities so don't forget to bring your own umbrellas, water, and other refreshments. 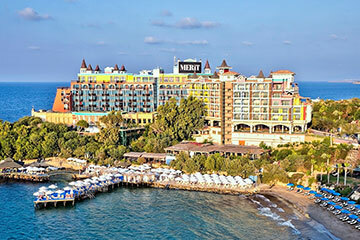 There are several hotel and private beaches in the Kyrenia area. The other Kyrenia beaches include Sunset Beach Club, Golden Bay, Camelot and many other hidden rocky bays await exploring. Do not expect to find lifeguards or any form of flag warning system on North Cyprus beaches. Never leave children unattended. Do not swim on your own and keep check of the tides, currents and strong winds. Swimmers should not get out of their depth and caution should be taken with all inflatable. Never drink and swim. Allow 1 hour after eating before swimming. Don't forget your sun-screen lotion when you are going to a beach, after staying 10 minutes under the summer sun, you will burn.